A little earlier in the year, I devised some questions for the dark-wave, HP Lovecraft themed group, NECRONOMIDOL via Selective Hearing, based around their up-coming tour to the United Kingdom where the group would visits Manchester, Birmingham and London for three live shows. Due to the groups busy schedule with both touring and recording, however, it was not possible for management to release the translated replies until now. I would like to thank both Greg of Selective Hearing and Ricky who is NECRONOMIDOL's manager for allowing me this opportunity to give the questions and to interview the group via e-mail. It's great to look back on the members' feelings before the show, and to also have a better understanding of the group after everything has already happened, as well as to see how well their answers fit in line with the recent shows. Please check out the original article on Selective Hearing, but do enjoy this version as well. Thank you very much. *As a side note, this version contains a few more questions and answers that do not appear in the Selective Hearing original. So, we have a bonus round. Enjoy! Hello and thank you for joining us here at Selective Hearing! Please tell us a little about yourselves and NECRONOMIDOL. ALL: We’re here to choke out your life! We’re the darkness-themed idols, NECRONOMIDOL. K: I'm NECRONOMIDOL's ace - Risaki Kakizaki. S: My life is a show - I'm Sari. H: I'm NECRONOMIDOL's red-ribbon twintailed "Tsuyupi" - Hina Yotsuyu. R: I'm the most carefree, easygoing member of NECRONOMIDOL - Rei Imaizumi. T: I want to live in 2D... I'm NECRONOMIDOL's resident anime otaku, Himari Tsukishiro. This will be your second time performing in England, and a first to perform in both Manchester and Birmingham. Are you excited to meet new fans and experience new cities in the UK? K: I'm really looking forward to it. Last year we were only in England for one day so we were only able to see the area around the venue in King's Cross. I'd like to spend more time and really see what England is like. S: We had a great time at our show in England last year and I think a lot of fans have been waiting for our return. I hope we meet new fans in the new cities as well! We've been practicing hard in Japan to show you all the best performance we can. H: I'm really looking forward to it. I seem to be able to discover a new me in new cities. I'm also looking forward to meeting new fans and seeing their smiling faces! R: I'll never forget how the fans in England remembered all the Japanese calls to our songs last year... I wonder if they've been practicing for this year I want to meet them soon and find out! Each country we visit has a different way of enjoying the performances but I think England is the closest to Japan. I'm always excited to go to new places and I love European architecture so I'd like to take a stroll through the new cities we will visit. T: Of course I'm looking forward to it, but... I want to head into the tour with a strong heart and meet you all! What are you most looking forward to during your travels? Do you want to try different food, look at various stores, or see the sights? K: First of all I'd really like to get a feel for what the country is really like. If I have time I'd like to do some shopping - I want to pick up a Tangle Teezer (a kind of British comb). S: I love going places for the first time so I'm really looking forward to it. I really enjoy experiencing different cultures on tour! H: I like seeing the cities themselves the most. When we have a busy schedule there isn't really time for sightseeing but I can still enjoy the buildings, roads and people - its all new and sparkly to me. Its all so delicious and both the taste (and portion size!) are different from what we have in Japan. T: I'm looking forward to the food and sights of the city, the smells... and being able to interact with the people there and their culture. Do you have a favourite English word or expression? K: "Awesome" - when I first learned what it meant in Japan it seemed to have negative connotations but it was really interesting to learn how its used in everyday conversation. R: "Cheer up!" - it makes you smile just by saying it and you can really encourage someone by just saying it! T: I want many people tell me "I love you". If you had the chance, would you like to star in your own Horror movie and sing the theme song for it? Who do you think would be the lead, and which member would be cast as the ghost? K: I think I would be the "last girl" in a slasher movie. For a ghost movie I think a more low-key protagonist is needed. Maybe Hina could be the lead? S: I don't know who would be the hero, but I think I'd definitely be the ghost. R: To be honest, I don't really like horror movies very much... but I'd still like to see one we were in! I also think Risaki would definitely be the heroine. And Hina should be the ghost! Her skin is so white and she's so beautiful I think she would be a perfect fit. So I guess I have the same opinion as the other members! T: I haven't seen many, but I would like to be in one. It was interesting to think about who might be the lead but I couldn't come up with just one. If the ghost is supposed to be a Japanese style "Sadako" like role... I'll take it on. You have a lot of support from Western fans, and the number is growing by the day. Why do you think NECRONOMIDOL appeals to not only Japanese fans, but Westerners, too? K: I think its because our producer, Ricky, has created the group from the perspective of a non-Japanese person. S: I think its because our producer is an American and we are made up for 5 girls who have different personality types you only encounter in Japan. R: Thank you for saying so! I think we represent Japanese culture well with Sari's Shironuri and our outfits but I think we also have something really unique in that our image is based in the works of HP Lovecraft - I think a lot of people are attracted by that! T: Lyrics, style of song, visuals... there are a lot of areas where I think you can strongly feel the appeal of Japanese culture. But our producer is an American so I think we are also put together to appeal internationally. Your music style is varied, but which song is your personal favourite, and which track would you like to perform in England for your fans? K: I really like the songs written by Kei Toriki, a member of the Necroma BAND as well as the band Asu no Jyoukei. They're dark, strong and beautiful at the same time. S: I also really like Kei Toriki's songs. But NECRONOMIDOL's strong point is that we have songs in so many different genres - I really want to show fans that breadth of field. R: I like all of our songs but at the moment I think I like STRANGE AEONS the most. It's unlike all our previous songs but its a song where you can see our strength and also the uniqueness of each member. We haven't played it yet in England so I'm really looking forward to that. And this is our first international tour with the Necroma BAND so I really want fans to experience ITHAQUA and MIDNIGHT DOMINATOR with the band backing us! T: There are so many that I like its hard to choose just one, but if I had to pick I would say SARNATH - I have some special lines in that song and as such it holds a special place with me. You each have a unique look, but is there another style you would like to try in music videos or Performances? K: I think I would dye all my hair, not just part, red. H: I think the members all have very distinct styles - its easy to draw us, for example. As for me, I dyed my hair for the first time in my life recently! R: Hmmm... When I joined the group my hair was long and I often think I'd like to grow it out again (although I probably won't, haha). I'd also like to grow out my bangs! T: I've thought I wanted to dye my hair for a few years. But even though its really hot in the summer at this point I have no desire to cut it! Since joining NECRONOMIDOL, who do you think has changed the most out of all the members? S: All the members, myself included, have grown a lot but I think at the end of the day Risaki has probably changed the most. R: Risaki, Sari and Hina joined before me so I don't really know what they were like when they joined the group. But I think both Himari and I have changed quite a bit! When I meet my friends they often remark on how I've grown stronger or am better at communication than I was before. When Himari joined the group I felt that she was really playful but now she's grown really strong - it's like she has an aura of confidence around her. For your new fans who will see you live for the first time this year, what would you like them to anticipate for your June performances? K: All the members have their own individual traits. We all really project ourselves on stage so I'd like fans to be able to take that in. Also, of course you can enjoy the show from far away but really I'd love you to check us out up-close at shows. I think it's much more powerful! S: I want fans to experience the unique atmosphere of our song and dance combined together. R: I really want them to see the uniqueness of the members, how strong our sound is and hear the influences of Lovecraft in our lyrics. Our performance is really about all of those things joined together. I think people who are fans of HPL or metal will really like our songs and people who are interested in Japanese idols will really enjoy the members' expressions and voices. But overall I want the fans to enjoy the show as a whole. I'm really looking forward to meeting all our fans! T: When I first saw NECRONOMIDOL play I thought "this is like a stage play..." - so for first time fans I'd like you to enjoy the show however you like. But please share your impressions with me afterwards! And a final word for your fans! Please express your thoughts on the up-coming BLACK WINDS OVER ALBION tour, and your wishes for future overseas performances! K: I'd like people outside Japan to find out about us and really enjoy our shows! 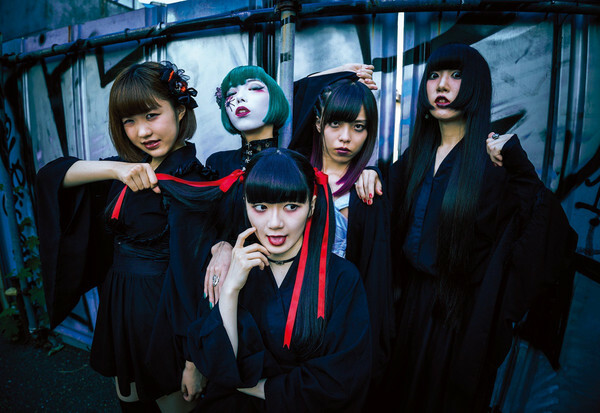 H: I'm looking forward to visiting new places and meeting new people but also for the fans who have seen us before to see the "new", upgraded NECRONOMIDOL. R: After our European tour in June we have some shows scheduled in August in the US as well. There aren't any definite plans for performances outside Japan after that, but I really want to keep touring around the world. I want the fans who support us around the world to know that even when we're in Japan we are working around the clock to prepare for more tours - please wait for us! I want to work hard so we can travel to even more countries and meet new fans there, too. Is there an aspect of your personality or style that you think will surprise your fans? other alt-Idols, both as a group and individually? S: Of course the originality of our music and performance. And even though we place a big emphasis on our unique image we're actually pretty tough so we can tour around a bit. As for myself, my shironuri style, of course. 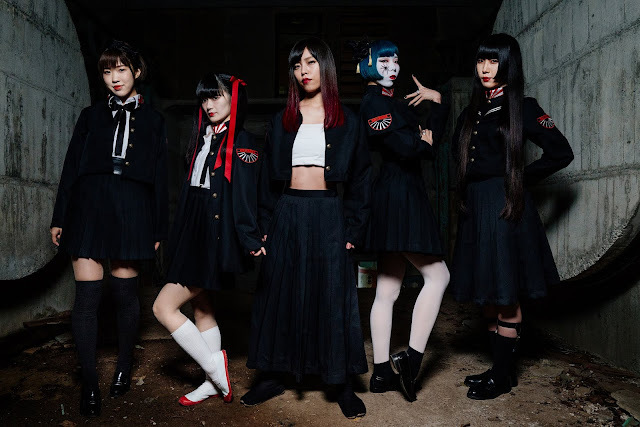 R: For Japanese idols its very unusual to see groups that base their uniforms on a single color (black) or take inspiration from "gakuran" (old-style male school uniforms). I also think our distinctive hair and makeup help us stand out. There also aren't many groups that have black metal songs so I really do think we are the only "darkness themed" idol group in Japan. As for myself, I'm the most stereotypical "idol" in the group but I think my positivity and energy create a good synergy! It's important to keep smiling. S: I want to improve my English so lately I've been listening to a lot of Western music. R: I love Japanese idol culture - every day I'm inspired by Hello! Project groups! What are your individual charm points? S: Shironuri, green hair, corset and the spider on my right cheek. R: My smile! I'm trying to change my expression from song to song to match their individual themes, so please keep an eye out for that! Personally, I like my long eyelashes.